The level of banking exams is increasing at a very fast pace. Therefore the candidates are required to shift the gear of their preparation. The section for English language and comprehension holds good weightage. 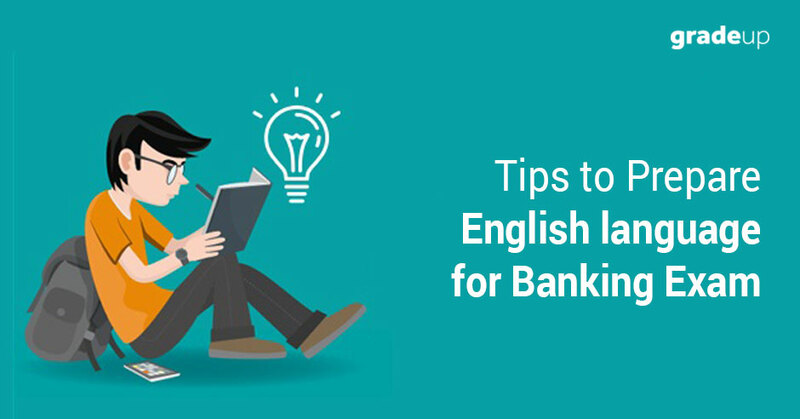 This article guides candidates in preparing for the English section for banking exams as per the current exam level. Read newspaper daily:- While reading newspaper have focus on news based on the above said sectors like Economic, Banking, Insurance Politics, Markets, Business and Technology. Make short notes of the passage as it will help in comprehending the passage. Also list down the difficult words as it will build your vocabulary. v Read between words: - it means stop reading one word at a time. The candidates should read a phrase instead. This helps candidates in grasping the main points of the passage in a go. In this way the candidates can have an idea of the passage that which piece of information is located at which line of passage. v Fix your head and move eyes: - This helps in increasing the speed of reading. Instead of moving head, while reading try to keep on moving eyes on the passage. This habit takes time to build, but consistent effort can bring great changes. Read articles from good sources: - There are many good websites which provide good quality articles on various trending topics of Economic, Banking, Insurance, Politics, Markets, Business and technology. This exercise will build the interest in banking sector and also there are chances that you may encounter the same article in exam. v Learn basics of the English Grammar from a good book or app. v Practice questions of different patterns in order to be familiar with the current trends. Word power made easy book: - The candidates must go through this book at least once. The words in this book are given in word root forms, which help candidates in grasping the related words with ease. The exercises given after every lesson are of good quality. Use mnemonics to remember words: - The use of mnemonics in remembering words helps candidates in remembering the words with ease. Our brain has the ability to remember new words by associative memory. In this technique we associate new words with old memories or events. Develop curiosity to learn new words: - In our childhood we grasp new words at a very fast pace because of our curiosity of knowing new things. In our adult age we gradually loose this curiosity and with that our habit of learning new words fades away. Always try to learn new things and whenever encounter new words or phrases try to remember their meaning and context. Practice mock test: - Practice English questions based on latest exam pattern & paper trends by attempting free mock Test for IBPS Clerk or Bank PO exam. Attempting mock test gives you clear idea about your strong & weak areas! 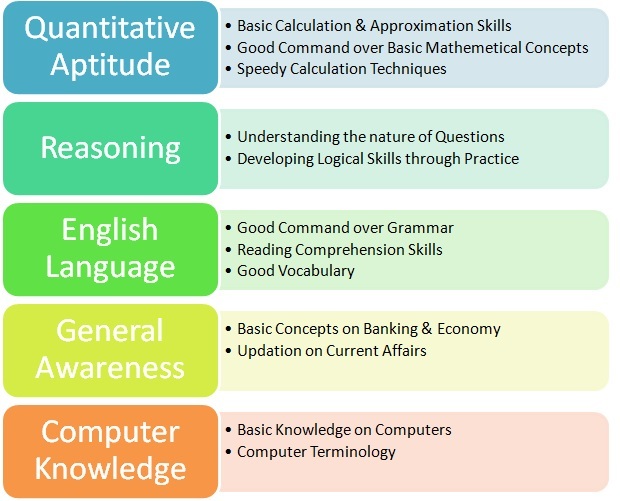 So, these are the topic wise strategy to hone your skills in English language. The candidates must analyse their own abilities. They should prioritise these topics as per their ability and knowledge. The mere completion of syllabus is not sufficient for IBPS PO exam. The next main thing is to practice the questions on current patterns. The candidates should attend as many quizzes and mock tests as they can. While attempting mocks try to find out the weak areas and practise that part more. The practise is key to success in banking exams. 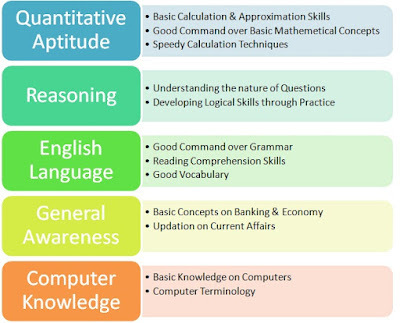 Normally the candidates ignore English section while preparing for the competitive exams. This is a very bad strategy as in banking exams you have to clear sectional cut offs as well and good preparation of English language can help in scoring good marks in exam. Merely securing overall cut off is not sufficient for getting job, the candidates must prepare English section properly to score high marks. If you wish to be updated regarding all upcoming Banking exams 2017-18, updated study material, and other important details, download banking exam preparation app. It provides study notes, free mock test, quizzes for various competitive exams in India. Becoming a lecturer requires an immense amount of skill and experience. While a postgraduate degree may not have been a necessity 40 or 50 years ago, it is a near necessity for anyone that is looking for lecturer jobs today. In most cases, you will need a PhD to enter into the field. You’ll need to choose which facet you like most. There are some lecturers who like to only discuss groundbreaking research that they’ve just been working on, while others love to lecture continually on topics that are relatively known. · Training: An immense amount of training goes in to becoming a lecturer. Universities are continually training lecturers on new teaching methods, classroom techniques and pedagogical skills. Initial training typically takes one year, with the lecturer earning a teacher qualification in the end. While not a necessity, having a teaching qualification can help you find your first job. · Research: Working as a lecturer requires you to be at the forefront of the field. You’ll be encouraged to be an active researcher, which is a big challenge for many lecturers. You’ll be required to work in different research areas as well as publications so that your seen as an expert in the field. Lecturer jobs require the best experts in the field. You will need to undergo immense amounts of studying and research so that you can build yourself up as an industry expert. It’s not an easy task, and this is a field where you’ll be a continual learner that is expected to always be up-to-date in the field. Having any publications under your name or having done any major research assignments is definitely a bonus for someone entering the field. In an ideal world, you’ll be able to become a lecturer at your respective University. This situation will allow you to ensure that you have the requirements and qualifications to get the job. Most universities will offer lecturing positions to a PhD that has shown the utmost in research and lecturing ability. Obtaining a high GPA is very important, with your grade point average being looked at as far back as your bachelor’s degree. While a formal teaching qualification is not going to be required by most universities, you will be expected to demonstrate your ability to teach students. If possible, attempt to land any job that will give you experience in teaching prior to becoming a lecturer. It is very important that you learn how to teach large groups of people. Lecturers who take any teaching classes as part of their curriculum during their studies will find that getting a job is much easier. Landing a permanent contract as a lecturer will be difficult at first, but permanent contracts will come as you gain more experience.